This is buttermilk syrup. Otherwise known as liquid gold or caramel crack. It's bad for you, like most delicious things. It's totally sinful, so I kind of save it for special occasions. Like Tuesdays. Buttermilk syrup goes with anything. Pancakes, waffles, french toast, ice cream, brownie sundaes, cheesecake, etc. 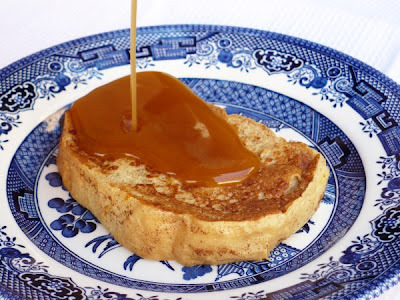 We recently paired it with Honey Orange French Toast; oo la la! **Update: today we dipped apple slices in this stuff - fabulous! In a LARGE pot (like a stock pot - this foams while cooking! ), combine buttermilk, sugar, butter, corn syrup, and baking soda. Bring ingredients to a boil and then reduce heat to low; cook, stirring frequently, for 8-9 minutes or until golden brown. Remove from heat and stir in vanilla. Let cool slightly before serving. You can skim the foam off the top if you wish.